IDBI Bank Executive Recruitment 2018 notification for filling up Online Application for Executive jobs in IDBI Bank at its different Branches and Offices. 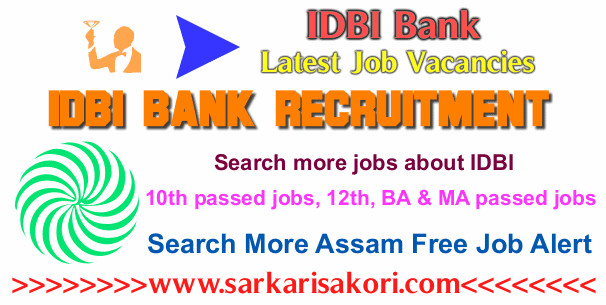 IDBI Bank Executive Recruitment 2018 notification for filling up Online Application for Executive jobs in IDBI Bank on contract basis at its different Branches and Offices. Qualification: A Degree (Graduation) in any discipline from a University recognized by the Govt. of India OR any equivalent qualification recognized as such by the Central Government with minimum 60% marks, (55% for SC/ ST/ PWD). Age Limit: 20 to 25 years as on 01-01-2018. Age relaxation is applicable as per rules. Qualified candidates will be selected based on the online test, document verification & medical test. Application Fee: An Intimation Charges of Rs. 150/- for SC/ ST/ PWD candidates and Rs. 700/- (Application fee + Intimation Charges) for all other candidates through online by using Debit Cards (RuPay/ Visa/ MasterCard/ Maestro), Credit Cards, Internet Banking, IMPS, Cash Cards/ Mobile Wallets. Modify details, if required, and click on “FINAL SUBMIT” ONLY after verifying and ensuring that the photograph, signature uploaded and other details filled by you are correct. Candidates are required to take a printout of the e-Receipt and online Application Form. Please note that if the same cannot be generated online, the transaction may not have been successful. * Tentative Date of Written Test: 28-04-2018. You will be interested more jobs about IDBI Bank Executive Recruitment 2018 or IDBI Bank Recruitment 2017-18 executives jobs.